A site specific performance, sounding and moving our aliveness and connection with the land. Singing the clear water, breathing the mountain, dancing the great turning. 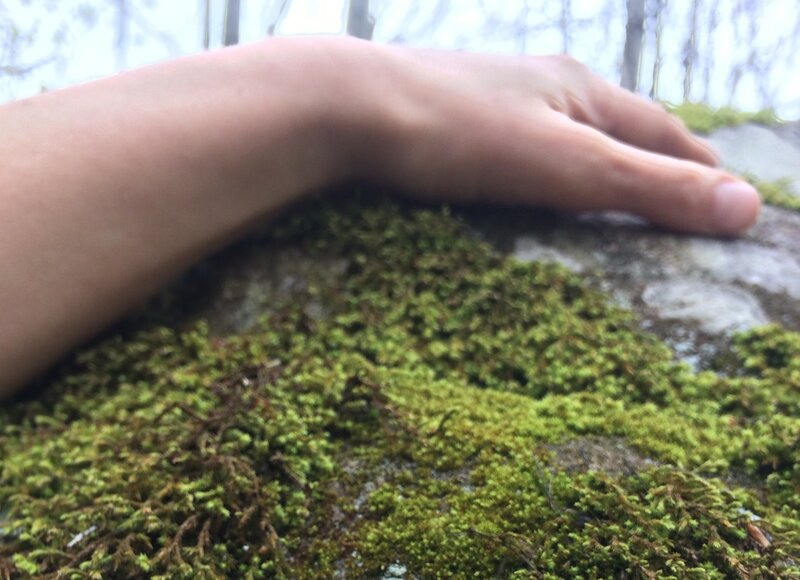 This outdoor performance traverses the woods and fields of Dreamland in Worcester, VT, inviting all present into a deeper awareness of how the stories unfolding around us are taking place within our bodies, our bones and blood. A creative performance that moves across the land. Be prepared to walk about a half mile through woods and fields in whatever the weather may be that day! Wear comfortable foot gear, clothing that allows you sit when it’s wet, layers, etc. Join us rain or shine. Available May 12th at eventbrite.com. There are limited audience spaces and no tickets available at the door. Tickets are free to reserve. There will be a donation vessel at the event. Suggested donation $10-30, children free. A ten-person ensemble exploring emergent sound and organic movement. Our practices of deep listening to the land and our bodies inspire our creation process. Directed by Amanda Franz and Heidi Wilson. Amanda Franz is an embodiment activist, movement artist and lover of all things wild. She is on a crusade to invite people into the profound intelligence of their bodies and reconnect all bodies to what’s alive, what it’s like to be a human-animal and how to bring this work into the Great Turning. Her personal areas of inquiry and training are contact improvisation, Butoh, Axis Syllabus, Authentic Movement, Body Mind Centering, Somatic Experiencing and Joanna Macy’s- “The Work that Reconnects”. Amanda currently co-creates THE EVERYTHING SPACE- a somatic education studio weaving together personal growth and dynamic social change, where she runs a private practice in somatic bodywork and movement education, teaches a slew of workshops and classes, consults with organizations for wellness workshops and somatic implementation and hosts her herbal business Wild Things Herbal Apothecary. Heidi Wilson is a singer-song-catcher with a passion for strengthening connection with one another and Mystery through music. She is drawn to the potent and surprising journey of deep-listening and collaborative emergent music making. Some of Heidi’s recent influences and trainings include Bobby McFerrin’s improvisational Circlesongs, and Rhiannon’s Vocal River work. Heidi currently leads singing with Village Harmony, The Summit School of Traditional Music and Culture, Sacred Sings, Plainfield Community Sing, and the Central Vermont Solidarity Singers. Parking is limited. Carpool if you can! Take exit 8 (Montpelier) off rt. 89 and follow signs for Rt. 12 North. You will go left at the 4th light which is also Main St. Follow Main St. until you get to the rotary. Follow signs for Rt. 12 N. Once on 12 you will travel about 8 miles. You will go thru the village of Putnamville. One mile further north you will turn left onto Downs Rd. As you turn on to Downs, there is a light yellow farm house on the corner with brown trim. Please drive SLOWLY by this house to uphold our relationship with the neighbors. Really important, thanks! Follow Downs for just about a mile. It is dirt and turns to class 4 (unmaintained) just before you get to our driveway. Beware of rocks! If you do not have good clearance you may want to park on the right side of the road before it gets rough and walk in. It isn’t far! Do not block the turn-around.